What lies at the heart of asymmetric leadership, through which the North-South bias can be balanced off by the relentless pursuit of an East-West imperative? 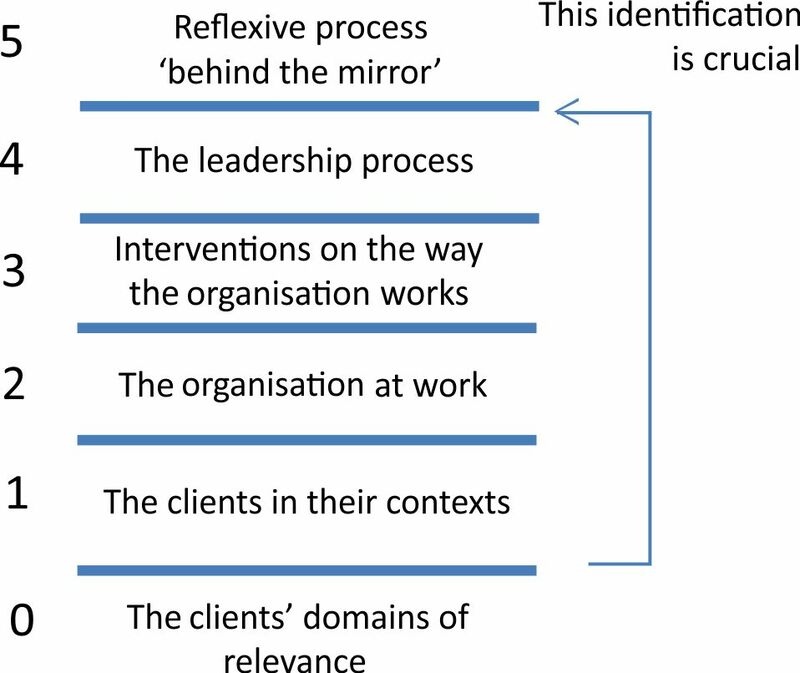 I believe the reflexive process ‘behind the mirror’ is at the heart of this form of leadership. Through reflexive process, the dynamic impact of unresolved dilemmas may be identified and worked through in parallel processes. 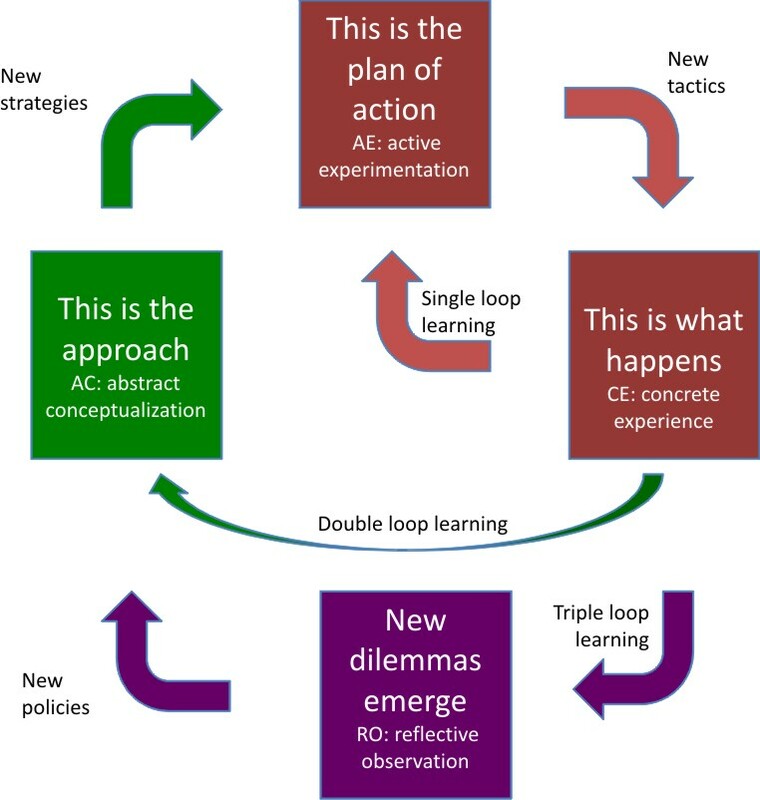 Triple loop learning is a way of thinking how these parallel processes interact with each other under asymmetric leadership, enabling the organisation as a whole to respond dynamically to the demands arising in a complex environment. 5->4 Reflective Observation: new dilemmas emerge in the experiences of clients in their contexts within their domains of relevance. 4->3 Abstract Conceptualisation: this is the leadership/governance process by which the intent of the organisation is kept sustainable. 3->2 Active Experimentation: this is the approach management takes in intervening on the way the organisation works. 2->1 Concrete Experience: this is the plan of action through the way the organisation works as a theory-in-use. 1->0 Reflective Observation: this is what actually happens for the clients in their contexts. single loop: changing how a chosen approach to interacting with a given environment is executed. double loop: changing how the approach to interacting with any one environment is chosen in pursuit of given direct effects. triple loop: changing how the approach to interacting with any one environment is chosen in pursuit of given indirect effects. 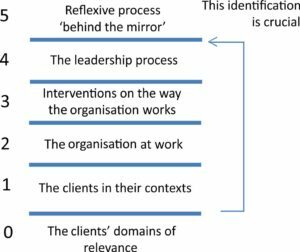 Relating this back to the parallel processes, the importance of the reflexive process becomes apparent – without this capability an organisation does not have the means of questioning its own assumptions as a part of its own ways of creating value for its clients. ‘Behind the mirror’ is a way of approaching what-is-going-on based on a metaphor with systemic family therapy. While an individual may be working with the family, a team observes what-is-going-on from behind a one-way mirror, trying to make sense of the family dynamics in ways that can support the individual working with the family. It is impossible to get an organisation in front of a one-way mirror (!) but the metaphor is used to indicate a certain kind of critical questioning of the relation between the observer’s interests and what is being observed. This is the ‘final cause’ of the organization’s behavior. The difference between the ‘reflective observation’ subject to this governance at 1->0 and at 5->4 is whether or not the governance processes are affiliated to an a priori intent, or an intent is able to emerge from an alliance with the client in which the value deficits experienced by clients come first. The direct effects are defined by a one-sided relationship to demand in which the value is inherent to the direct behaviors of the organisation. The indirect effects are defined by a multi-sided relationship to demand in which the value is inherent in the indirect behaviors supported by the direct behaviors of the organisation. See the asymmetric nature of multi-sided demand. The implications of such an approach are that the organisation has to pursue a platform strategy in order to capture indirect value from the relationships between its different kinds of customer rather than solely direct value. See what distinguishes a platform strategy. This is not to say that this questioning does not happen – only that without a reflexive process, the learning has to take place ‘above the strategy ceiling’. This may work in relatively stable environments, but in complex turbulent environments such an ‘above-the-ceiling’ process does not enable the organisation to be sufficiently dynamically adaptive. See Tempo, Entanglement and East-West dominance.